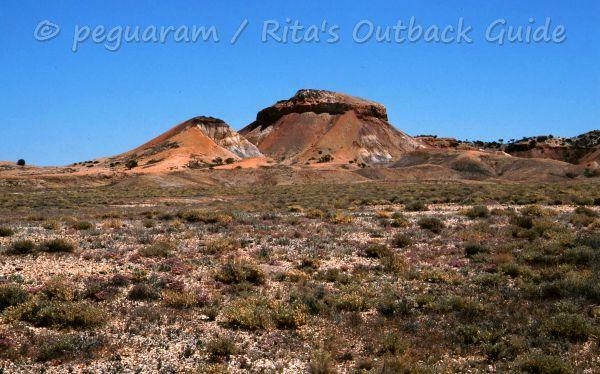 The Painted Desert in South Australia, also known as the Arckaringa Hills, is an area of spellbinding beauty. It is a geological wonderland, and a photographers' delight. When you are keen to take very spectacular Outback photos, this is a must visit place. Join me on a trip to this land of stunning beauty. The colours in the cliff formations are amazing and vary from yellow to brown, with all shades of orange and red, depending on the time of the day. As so often in the Australian Outback, nature turns on a brilliant firework of colours at dawn or dusk. This ancient landscape has been created by erosion over 80 million years. In ancient times, an inland sea laid down the sediments which were covered by an enduring silica crust. Although this "Duricrust" protects the layers beneath, erosion takes its toll and the edges break away, revealing the colourful strata. This Breakaway country is the result of prolonged weathering. Because of its geological importance, 850km² of the Painted Desert area was declared "The Arckaringa Hills state heritage area" in 1985. As the ground is very soft and fragile, please stay on the designated tracks and walking paths. Climb one of the low hills and enjoy the spectacular scenery, it is so unreal. Where is the Painted Desert? 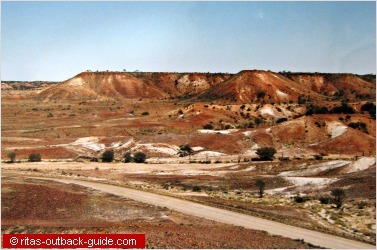 The Arckaringa Hills are 150kms north of Coober Pedy. The heritage area begins near Arckaringa homestead and stretches to the north and east, including Mount Arckaringa, Mount Andrews and parts of Arckaringa creek. You can access the region either from Stuart Highway, or the Oodnadatta Track. Cadney Park (Stuart Hwy) to Oodnadatta 176km. This is a lovely drive through hilly country. You'll pass by Copper Hill homestead, after about 85kms you reach Arckaringa homestead. 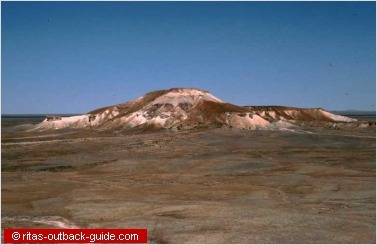 From here it is only 11 kms to the Painted Desert area. Make sure you follow always the road to Oodnadatta (there are a few side tracks, but usually well sign-posted). 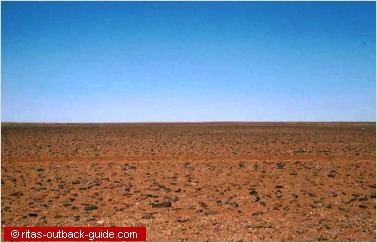 At 125km from Cadney, you reach a junction, keep left, and 45kms further on you are in Oodnadatta. For travellers on the Oodnadatta Track, this route (in the opposite direction, of course) is slightly shorter than going from Oodnadatta back to the Stuart Hwy. It is the most scenic alternative to get back to the highway. 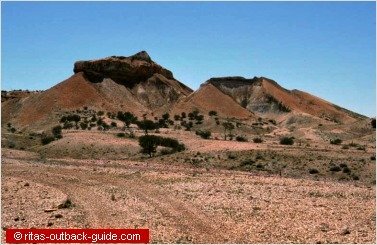 You 'll take the same route as decribed above from Cadney Park until you reach the Oodnadatta / Coober Pedy junction. Turn to the right here. Expect a huge surprise when you see how the scenery changes. You will drive through one of the flattest and most desolated landscapes. Yes, it is the Moon Plain! You have heard about it? Famous movies like Mad Max Beyond Thunderdome and Priscilla, Queen of the Outback had the Moon Plain as a back drop. 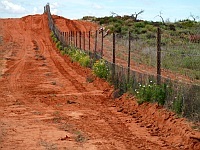 Shortly before you arrive in the opal town Coober Pedy you pass by the famous dingo fence. The hills on the horizon are The Breakaways, another stunning example of mesas and colourfull rocks. Although the tour to the Arckaringa Hills is fairly short by Australian standards, please be aware that this is very remote country. Take plenty of water, wear sturdy walking boots, a hat, and don't forget the sunblock cream. Follow my Outback driving tips, and always ask for road conditions before you go on unsealed roads. Coober Pedy, Oodnadatta and Cadney Park offer fuel, food and accommodation. Camping in the Painted Desert is not allowed. Arckaringa Homestead offer basic cabin accommodation & camping facilities. If you want to catch the magic of a desert sunset or sunrise, it is a good idea to stay at the homestead overnight. Especially early mornings and in the late afternoon the mesas and rocks show a lineup of amazing colours, it is a breath-taking scenery. Best time to travel is from April to September. Summer can be very hot, and January and February have the highest chance of rain. Yes, this is arid country, but rain turn the tracks into a quagmire fairly quick. Avoid driving on wet tracks, especially in a 2WD vehicle. When a track is closed don't use it. Fines are heavy, and you can bring yourself into deep trouble. For more information on the Painted Desert area check the following pages. Do you like this page? Your friends might enjoy it too. Please share it, thank you. Copyright © 2007- Rita Amend.